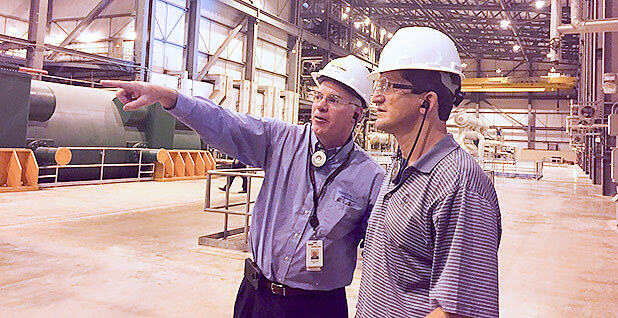 Republican clean energy advocate Jay Faison (right) tours a coal mine and power plant facility in Illinois. Photo courtesy of Faison via Twitter. When North Carolina entrepreneur Jay Faison unveiled the newest super political action committee to target energy policy in federal elections, he drew more than a few comparisons to California billionaire environmental activist Tom Steyer. However, the duo split not only on their partisan preferences — with Faison's ClearPath Action Fund backing Republican nominees while Steyer's NextGen Climate prefers Democrats — but on the return on those investments, with Faison basking in the success of the candidates his group boosted in this election cycle. In the first cycle in which the climate policy advocates faced off, they also pursued opposing strategies on spending — investing strikingly different amounts and earning starkly different results on Election Day. Echoing his spending in the 2014 cycle, when he spent more than $75 million via NextGen, Steyer once again positioned himself as the biggest federal donor in the 2016 cycle: He put more than $67 million in his efforts to boost specific candidates, according to data compiled by the Center for Responsive Politics. But that big cash infusion didn't provide much of a return. NextGen's preferred presidential nominee, Democrat Hillary Clinton, won the popular vote but badly lost the Electoral College. Similarly, three of its six senatorial candidates lost their bids — former Ohio Gov. Ted Strickland (D), former North Carolina state Rep. Deborah Ross and former White House Council on Environmental Quality chief Katie McGinty (D) in Pennsylvania. By comparison, Faison's ClearPath won 13 of the 15 races in which it endorsed candidates — and at a cost of just $4.8 million. "Clean energy voters are the most persuadable votes out there, and there's roughly 15 million of them," Faison told E&E News in an interview yesterday. But even Faison acknowledged that his group's success in its first election cycle was significantly better than anticipated. "I think there were a lot of surprises last night. I know we would have never predicted we would win 13 out of 15," Faison said. The group's two losses came as Republican Rep. Bob Dold lost his Illinois seat and New Hampshire Sen. Kelly Ayotte (R) lost her re-election bid by about 700 votes to Gov. Maggie Hassan (D). Hassan had claimed the support of environmental groups, including NextGen Climate. Faison credits his group's success to a targeted advertising model and conducting its own internal polling — including a control group of voters not exposed to its ads — to test its messaging throughout the cycle. The work included candidate-specific websites as well as digital ads and direct mail. ClearPath Action will release more analysis of its work in a few weeks and plans to post its findings publicly, Faison said. "We're conducting polling right now to see how far they moved the needle," he said. While it is too early to determine how many or which races in the 2018 midterm election ClearPath Action will target, Faison said the group will likely expand its focus and increase its spending. "We'll be able to raise more money given the success we had and the ability to do more races," he said, noting that the group's first-cycle success "doesn't hurt." In the meantime, Faison said, the ClearPath Foundation will work with the Trump administration and Republicans on Capitol Hill to address energy policy in the 115th Congress. "We've already been working with the [Trump] policy team some, especially around areas like nuclear, where we all agree we've overregulated our nuclear industry and it's important for national security, jobs and the environment," Faison said. He also plans to focus on areas including hydropower and coal technologies. Environmental groups — which spent more than $100 million on efforts to elect their preferred candidates in the 2016 cycle, will conduct a review of what went right — and very wrong — in the coming weeks. "We have just begun to look at what happened," EDF Action spokesman Keith Gaby told E&E News when asked about the disconnect between environmental campaign spending and electoral victories this week. League of Conservation Voters President Gene Karpinski defended the group's record expenditure of more than $45 million, arguing that despite failures on the federal level, the environmental group saw success in its state-level campaigns. "In terms of our investment, we're proud of what we did," Karpinski said at a press conference at the National Press Club. "We've done more than ever before. There are better stories to tell of the state-level investments than the federal level, although there were some success stories there. We just need to keep fighting, because we know the challenge is real. We know the public is on our side. We just have to keep going." In addition to the presidential cycle — where the LCV Action Fund backed Clinton in its earliest-ever endorsement — the group worked on behalf of 17 Senate candidates, nine of whom won their campaigns. The LCV also endorsed 86 House candidates, of whom 52 won. Among the biggest victories were Illinois Rep. Tammy Duckworth (D), who ousted Republican Sen. Mark Kirk, and former Nevada state Attorney General Catherine Cortez Masto (D), who will succeed retiring Senate Minority Leader Harry Reid (D). But major losses included North Carolina, where the group spent more than $3 million in a failed effort to oust Sen. Richard Burr (R), and Pennsylvania, where it spent more than $2 million to oust Sen. Pat Toomey (R). Sky Gallegos, NextGen Climate Action's executive vice president of political strategy, likewise defended his group's spending, pointing to wins in Nevada and New Hampshire. "We are definitively proud of our investment. We think that our engagement of young voters across these states was part of what helped us win in Nevada, could be what helps us get over the line in New Hampshire," Gallegos said. "I think that coalition that we created and we built with our brothers and sisters in labor and with those community organizations I met earlier is stronger than ever and continues to grow." She added: "I know Tom believes the investment in all of that was well worth it." Still, environmentalists acknowledge that the White House is a particularly stinging defeat. Trump has vowed to undo key Obama administration climate policies, as well as "cancel" U.S. participation in the Paris climate agreement. Karpinski said it is "deeply distressing" that a candidate who repeatedly called climate change a "hoax" on social media was not challenged on his stance by the media. He added that while Trump tried to walk back that sentiment in the first presidential debate — incorrectly denying that he had ever characterized global warming that way despite doing so repeatedly on social media — "no one ever challenged him again in a public setting. That's unfortunate" (E&E Daily, Sept. 27). In the wake of election victories that will give Republicans control of the White House, House and Senate, environmentalists vowed to organize to oppose major changes to climate policies or public lands. "Even as the fossil-fueled stormfront of Trumpism darkens our nation's future, our hearts are lifted by the amazing leadership of the Climate Hawks Vote community," Climate Hawks Vote Executive Director Brad Johnson said in a statement. "We're guided by [labor activist] Joe Hill's immortal words: 'Don't waste any time mourning. Organize!'"